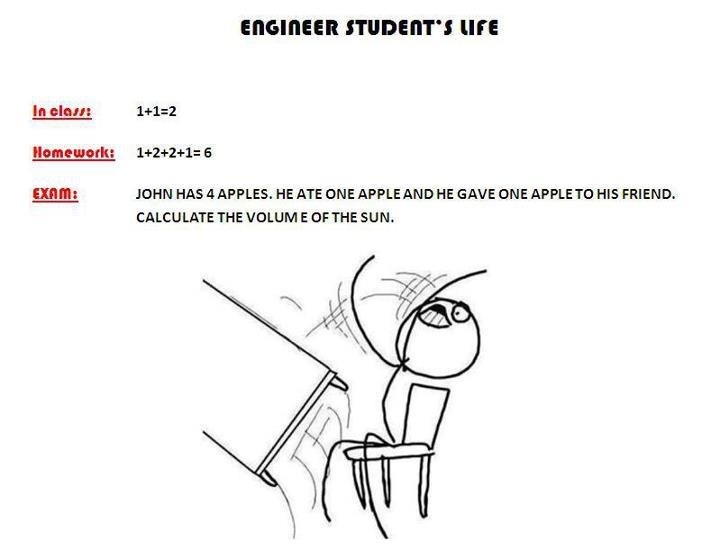 I was texting a friend a couple of days ago about the big change from sophomore and freshman when he sends me this hilarious picture about the typical day of an engineer’s life. You know, I felt like this about all my classes during the past two weeks, getting overwhelmed with 3 of them in one week and not doing do great on one of them. And sometimes I think exams don’t completely justify your knowledge on the material. I walked into one of my exams ready to “bang it out” as I should say, but completely blanked out as soon as I saw the first problem. Nerves can get to you when taking a test and the directions that you are reading no longer make sense. You start to think, “Oh crap. What is this talking about”, or “how do you even do this?” are some of the things you might say. And if you can can’t calm yourself down, then it can get really ugly. But the best thing I can say is that you have to dominate the test. Don’t let it dominate you. Even if it seems impossible, don’t let it affect you mentally. It’s a lot easier said than done, but I was able to do this for my Calc III exam, which was my last exam, and hopefully I didn’t do as bad as I thought. The test was….. WEIRD. That’s the best word to describe it, but nonetheless I went in to the test and had the mindset of a BOSS.. No worries, no anxiety. Just do the problems as if they were practice.